How will you honor those who served our country? How about giving the gift of justice? I was shocked to learn recently that there are 400 rural veterans facing legal barriers to benefits and medical care they need – and that they are over 300 miles from the closest nonprofit legal organization that can help! To be honest, I was always a little bit vague about what exactly we’re supposed to do on Veterans Day. I know it is a day to honor all the brave women and men who have served our country in the armed services – but it was never more specific than that for me. Until now. Several weeks ago, the OneJustice Pro Bono Team received a call from Chief Judge Abby Abinanti of the Yurok Tribal Court – with some shocking news and a request for help. She was calling because there are around 400 members of the tribe who are also U.S. veterans who are facing legal barriers to critically important benefits and medical care. And they are over 300 miles – 7 hours by car – from the closest legal nonprofit organization that can help them. So – clearly tha t calls for a Justice Bus response! Of course there were some possible obstacles – but we quickly solved them. Yes, it will be the farthest we’ve ever taken the Justice Bus Project- but University of San Francisco Law School readily agreed to have their students travel the distance to help. Never mind that we need a new nonprofit partner – we had already been talking to Swords to Plowshares about working together to do Justice Bus trips to serve veterans in rural and isolated parts of Northern California. Now the only remaining barrier to getting on the road should also be easy to overcome – the funding to cover the costs of the long bus ride and accommodations for the student volunteers willing to donate their time and energy to deliver free legal clinics in three locations – Eureka, Klamath, and Hoopa – over two days. The trip will take $10,000. Two generous donors each already donated $2,500 because they were so moved by the story of these veterans. This means we have just $5,000 to go and we will be able to gear up some mobile justice. So, we need YOUR HELP. 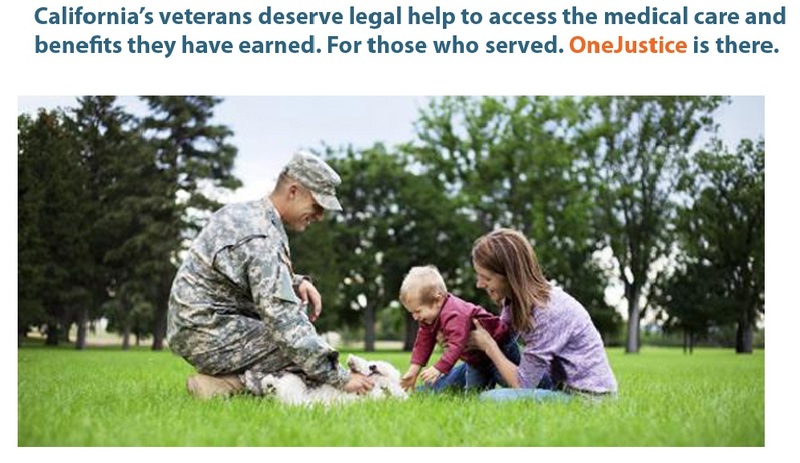 If 500 people in the OneJustice network each give just $10 on Veterans Day, we’ll be able to get the bus on the road. We can do this through collective action – we can stretch the legal safety net in our state to include these veterans who have asked for our help. It’s easy to give online (just click HERE). Just make your donation and designate the Veterans Legal Aid Fund. Or download a donation form HERE and send in a check. Literally every dollar gets us closer to making this trip a reality. If you give in honor of a veteran or service member in your life, we will list their name on our Wall of Honor for one year and read their name aloud as the Justice Bus starts its trip north in early January 2013. So – this Veterans Day I will be carrying the knowledge of these 400 Yurok veterans in need in my heart. It is an incredible honor to be invited into their lives to provide access to the legal help they need – and with that honor comes the responsibility to respond. They already served for us. Now the time has come when we can serve them. 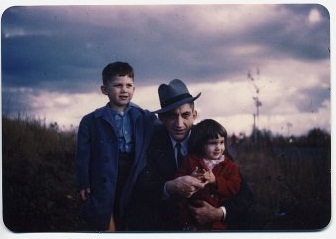 My grandfather, Charles Ward Henson II, with his children, my father and aunt. My grandfather, who passed away before I was born, served for 5 years in the army – including 26 months in New Guinea during World War II. This Sunday, at 11am, I will proudly make my own personal donation in his name to make this trip possible. I hope you will join me in giving the gift of justice to these veterans! Thank you for your support – we are honored by your charitable investment in our work! I’m going to tweet and post on LinkedIn. These folks helped us. Now it’s our turn to help them. What better way to celebrate Veteran’s Day? Thanks for your important work. Thank you, Claire, for your support! Together the OneJustice network can make this happen!